Successfully Added Sunroad Muslim Prayer Watch - Qiblah Compass, Prayer Reminders, Hijri Calander, World Time Zones, Water Resistant 3ATM to your Shopping Cart. World Time zones with auto daylight savings and with Prayer reminders for whichever is your local time. The call to prayer is present throughout much of the world but for those who travel to different time zones or who are always on the go it can be hard to work out when and where to pray, especially without a reminder. With the SR810 pray watch from Sunroad you will always know when each of the five prayers should take place no matter what time zone you’re in or what prayer calculation your use, be it MWL, ISNA, Makkah or any of the other well known conventions. Just set the time zone for your current location from the 28 available options and this prayer watch will provide you with a prayer reminder as well as point you in the correct direction for Mecca thanks to its Qiblah compass, that will give a beep when you align the watch in correctly. This built in compass can also be used to determine your current facing and is a wonderful guide when navigating a new town or city, so you will never get lost with this watch on your wrist. You can adjust the watch to calculate prayer times according to several of the well known conventions currently in use, which will automatically update the prayer times and reminders in for your current location. Each of the five prayer times can be displayed in a digital format on the watch and you can easily switch between the Hijri and Gregorian calendar functions. With this carefully crafted watch you can travel the globe and always be aware of where and when to pray. This Prayer Watch comes with a 12 months warranty. 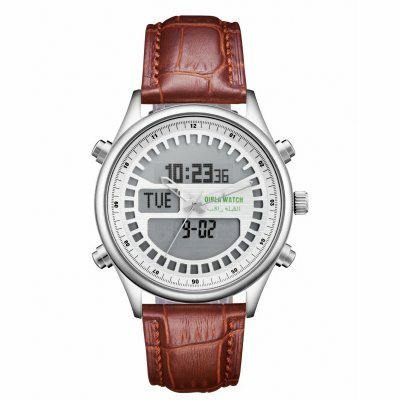 Brought to you by the leader in electronic devices as well as wholesale Digital Watches..